Fireside Ale | Weyerbacher Brewing Co. Tiny off-white head; slight lacing. Caramel malt nose; where's the smoke? Medium mouthfeel, bordering on thick. Mild flavor of sweet malts, like an English Barleywine. No smoke present. From tasting notes. L: Pours brilliant dark amber to chestnut with a 1” cream colored head that dissipates to film. S: Light to moderate smoke on the nose with caramel and malt. T: The smoke approaches Schlenkerla levels and seasons sweet dark sugars, fruit, a little cola, a suggestion of anise and some bitterness in the aftertaste. F: Creamy, full bodied, medium carbonation. O: While a little sweet, fairly well balanced between the smoke and other flavors. 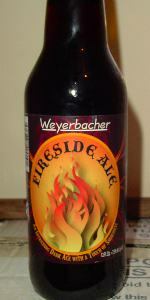 Fireside Ale from Weyerbacher Brewing Co.